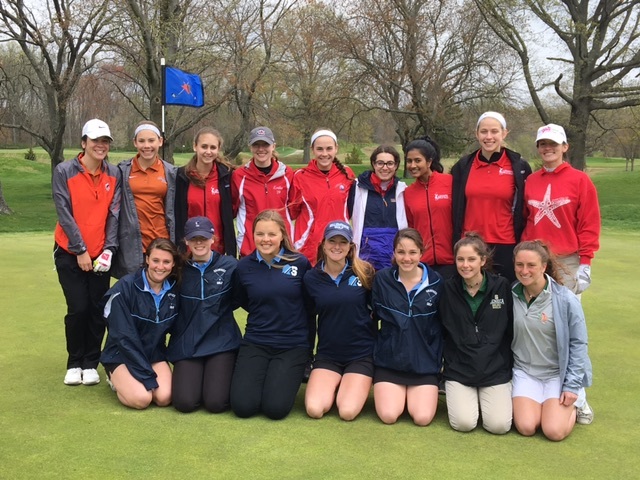 Golfers from all four Lenape Regional High School District schools gather on the green during the inaugural LRHSD Girls Golf Cup in 2018. PGA professional Brad Hare’s love of girls golf is evident upon walking into his GolfU facility in Cherry Hill. Scattered among the shop, putting greens and golf simulators are girls golf hats, T-shirts and other items. Hare spoke excitedly as he talked about the giveaways he would provide to this year’s participants in the GolfU LPGA Girls Golf Classic, a girls-only high school tournament taking place at Old York Country Club on Monday, April 29. Hare has seen dozens of girls come through his GolfU facility eager to play for their local high schools. He has also found himself advocating on their behalf in recent years as, until recently, many of the girls had no team to play for. Just three years ago, girls golf teams were nearly non-existent in South Jersey. Only two schools, Moorestown High School and Cumberland Regional High School, had full girls golf teams in the region. Girls who wanted to golf at other schools would have to compete to win a spot on the boys team, a tall task for all but the top players in the region. This year, girls golf is taking a huge leap forward in South Jersey. In addition to Moorestown and Cumberland, all four Lenape Regional High School District schools, Williamstown High School, Paul VI High School and Kingsway Regional High School will field full teams in 2019. The additional teams allows for all nine schools to now play each other as part of the girls golf Olympic Conference. Regan King, Sydney Goldstein and Brynn Foley will be three of Lenape’s varsity golfers in their first season competing as a fully-sanctioned team. The addition of a South Jersey girls golf league comes after years of hard work and advocacy from several members of the golf community. A big push was made in the Lenape District a few years ago. Hare, a Medford resident, and several other parents in the district pleaded with the Lenape district BOE to add girls golf. After hearing parents advocate for the sport, the district decided to start a two-year pilot program prior to the 2017 season, allowing Lenape, Cherokee, Seneca and Shawnee to all have girls golf teams. Since 2017, all four schools have seen a large increase in the number of players trying out for the sport. The district also added a tournament for its four schools called the LRHSD Girls Golf Cup in 2018. Hare believes the biggest reason the district’s pilot program grew to become a full program was a decision to hire separate coaches for the girls teams. He credited all four district coaches; Andre Lopez at Lenape, Megan Boland at Cherokee, Kyle Packer at Shawnee and Matt Abate at Seneca, for embracing the challenge of building programs from the ground up. Hare said Lopez, in particular, was a big factor in promoting girls golf across the district from the beginning. Prior to becoming the girls head coach, Lopez was an assistant to boys head coach Chris Foley. When the pilot program started, the two coaches decided someone needed to focus solely on the girls. 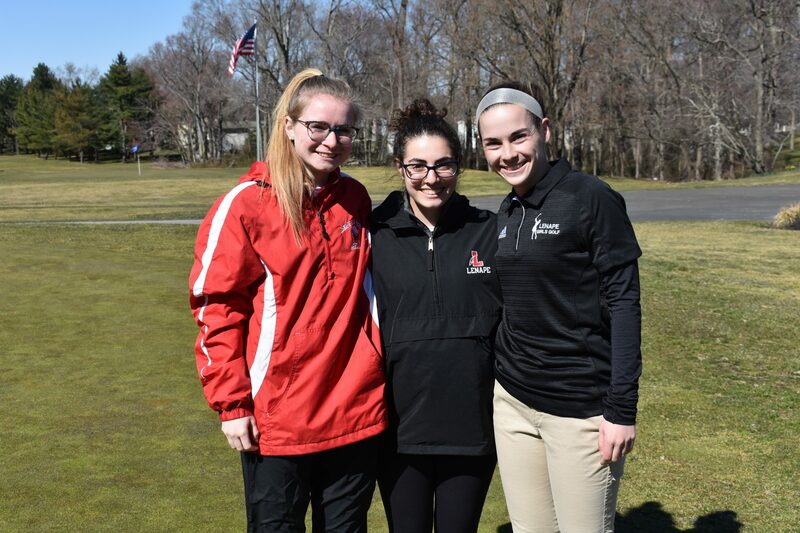 Three of Lenape’s top golfers entering this season, juniors Regan King and Brynn Foley and senior Sydney Goldstein, all joined the program for the first pilot season. All three of them had barely played golf prior to 2017. Despite the early challenges, the three girls stuck with the sport because of the friendships they built and the drive they received to better themselves as individuals. “I like the friendships and that over the summer, I can call up a bunch of people and say, let’s go golfing,” King said. Lopez has seen the enthusiasm for the program spread in Lenape as well as the other district schools. For Lenape, the number of players in the program has doubled from 12 in 2017 to 24 in 2019. Moorestown girls golf is joining the Olympic Conference after years of competing in Central Jersey. The upcoming season isn’t just exciting for the new programs. 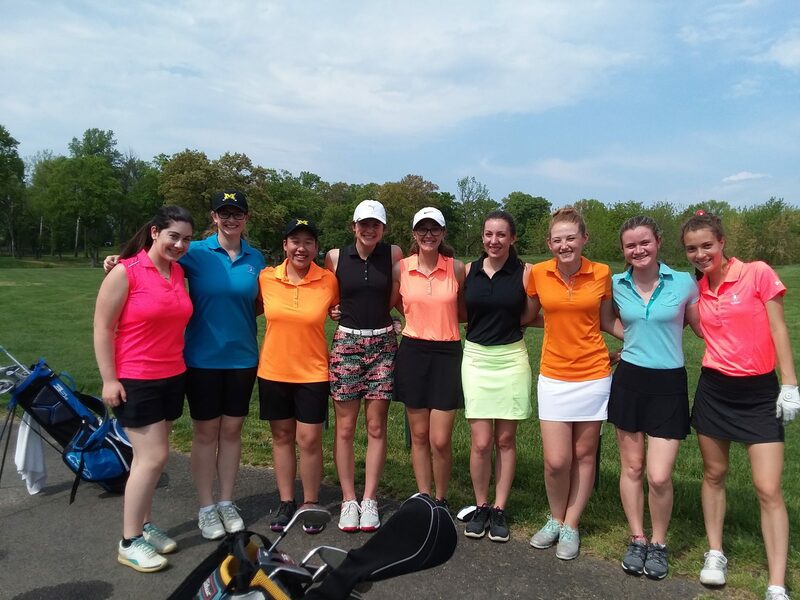 Charlotte Heenan, head coach of Moorestown girls golf for more than a decade, said everyone involved with her program is thrilled to finally compete in a South Jersey league. With no South Jersey conference sponsoring golf in the past, Moorestown previously competed in the Central Jersey Girls Golf League, forcing them to take constant long bus rides for road matches. Hare has coached numerous Moorestown players over the years at GolfU and would hear the players tell him about the Quakers’ crazy travel schedule. Not only does the new league cut down on Moorestown’s travel, but also allows them to play with neighboring schools. Many of the Moorestown players have friends who play for other schools and will get to compete with each other on a more regular basis. While Moorestown is an established program competing against teams that are just getting their feet wet, Heenan believes the competition will be tough early on. She was impressed with Seneca High School’s performance during a preseason scrimmage and believes some of the new teams can compete with the Quakers this season. 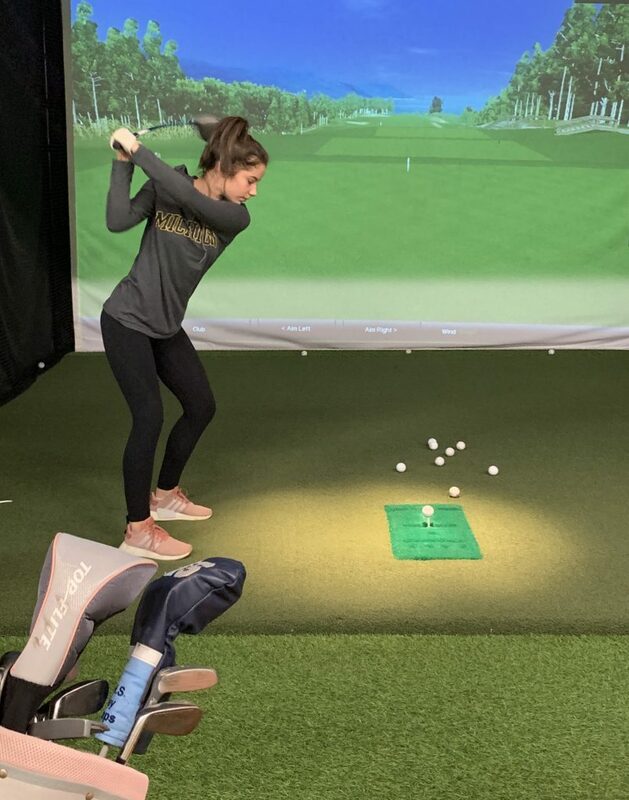 Seneca junior Maddie Dwyer is one of several girls golf players who trains at GolfU. Entering this season, the girls golf coaches aren’t focused so much on wins and losses, but instead the impact they are having with the expansion of girls golf in South Jersey. Heenan sees this season as a huge milestone for the sport. “For them to have those extra opportunities, it shows how far we’ve come, not only in our country, but in the microcosm of our community,” Heenan said. Hare and Lopez described this year’s players as pioneers who are setting the stage for dozens of future female golfers. Moving forward, Hare envisions more girls in elementary and middle school sticking with golf with the prospect of playing in high school. He also believes numerous other schools, such as Eastern Regional High School, Cherry Hill High School East and Clearview Regional High School could add the sport in the near future. Lopez believes the key to the growth of girls golf is the current players. He feels the camaraderie the players across the region share will only encourage more girls to try out for their local schools.